In some pioneering, early work, Donna Haraway drew attention to the metaphor of the crystal in organizing certain kinds of biological research in the mid twentieth century. Here I want to extend that inquiry across the boundary between the sciences, the social and the cultural. My focus is the work of John Desmond Bernal, a key figure in the science of x-ray crystallography, but also central to the Anglophone scientific left from the late 20s through to the cold war. I will look at possible homologies in how Bernal thought about structure in both his scientific and social thought. I then extend the frame to consider the important work Rosalind Franklin did in his lab and Dorothy Hodgkin did as one of his most prominent students. I will also look at how visual iconography drawn from the crystallography of Helen Megaw ended up in textile and ceramic design work for the Festival of Britain after the war. The larger ambition might be to take a media studies and visual culture approach to the continuum of scientific and social concerns of a period which was a high point of political activism and scientific optimism. Professor Karen Barad will be the official "respondent" to Wark's talk. McKenzie Wark is the author of A Hacker Manifesto, Gamer Theory, 50 Years of Recuperation of the Situationist International and The Beach Beneath the Street, among other books. He teaches at the New School for Social Research and Eugene Lang College in New York City. 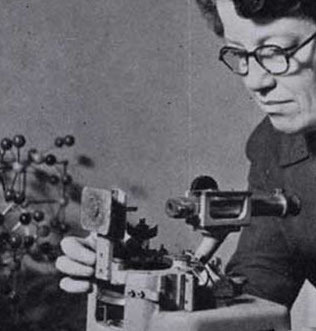 Image caption: Crystallographer Helen Megaw. Free and open to the public. Parking permits may be purchased at the pay station located in the Performing Arts lot.